I’m sharing three transitional spring outfits today featuring all linen pieces by Elizabeth Suzann. You might remember back in the winter when I shared winter layering outfits. Now that it’s spring, the weather has started to warm up a touch, but there are still those days when mother nature can’t decide what season it is. If you’ve never heard of Elizabeth Suzann before, I’m excited that I get to be the first to introduce this brand to you. Elizabeth Suzann is a brand that I’ve admired since the start of my journey in exploring sustainable and ethical fashion. Their garments are intentionally designed to be timeless, quality pieces that last. It’s evident that they value people. I can see it through their representation of different cultures, ethnicities, and body types throughout their brand. 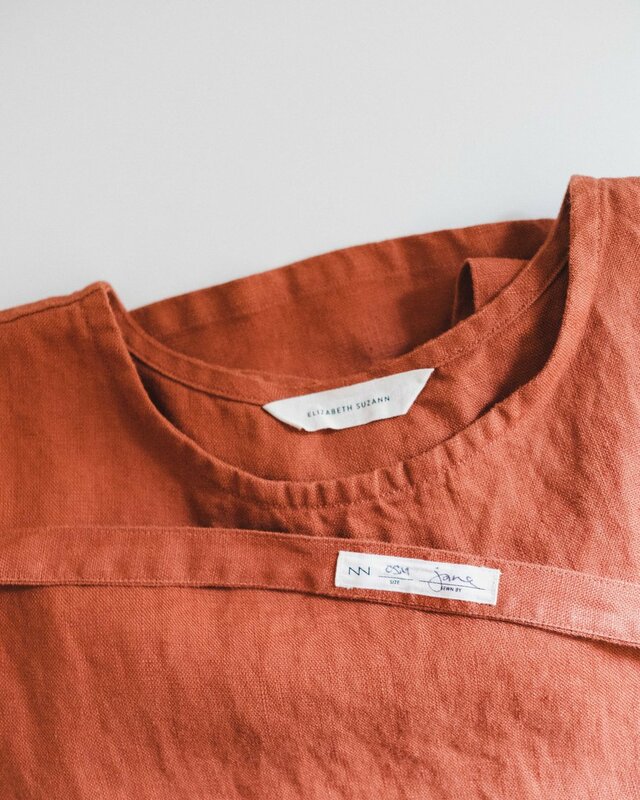 I love that there are small touches displayed in each garment such as tags that tell me who made my garment. It’s a nice reminder that there’s a real person behind each piece carefully crafting it with pride. I also love that they use natural fibre materials and are all designed, cut, and sewn in Nashville. You can even take a peek at their studio here. This is definitely a dream partnership and I’m so honoured to be able to collaborate with a company that so closely aligns with my sustainable goals and values. 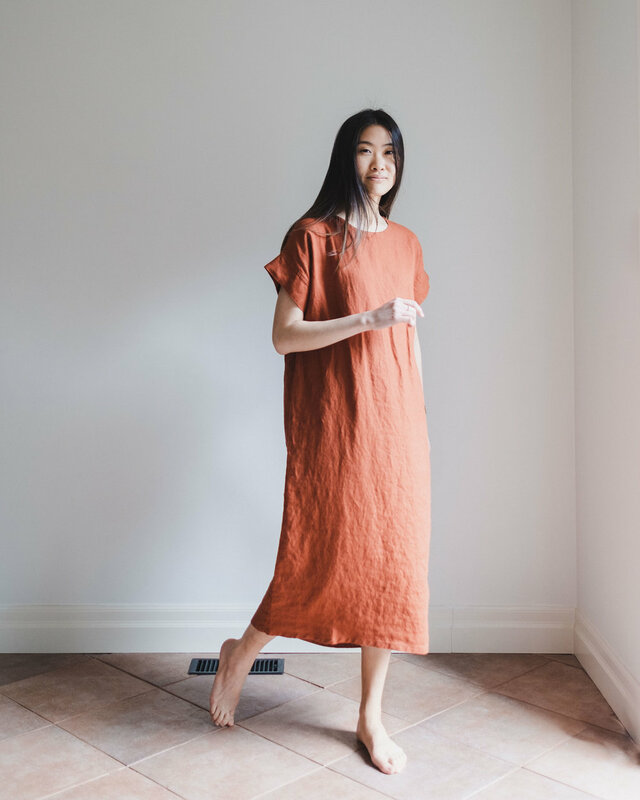 As you may know, Elizabeth Suzann just launched some styles in new linen gauze colours to their Warm Weather Collection. I thought it would be nice to show you the pieces on its own and then styled. This is probably the most colourful piece in my wardrobe at the moment. I’m in love with this gorgeous Terra colour for the warmer months. I’m wearing the Georgia Midi in one of their signature materials - midweight linen. I’ve styled this midi dress over a pair of linen trousers and completed with my chucks. I can’t wait until it actually gets warm enough to wear this outfit! This piece can also be styled with a belt for a more pulled together look. Here is the same Georgia Midi in one of the new linen gauze colours, Ivory. This is the epitome of a spring/summer dress. It’s lightweight, breathable and can be styled up or down. The linen gauze material has more of a textured feel to it, making the garment appear pillowy and light. I think this material is a great alternative to traditional linen if you can’t stand the wrinkles because this material is a naturally crinkly material with lots of texture already. This midi dress can be worn on its own or paired with trousers, like I’ve done here. Since it’s a very neutral ivory colour, I styled it with more earthy-toned trousers and clogs. 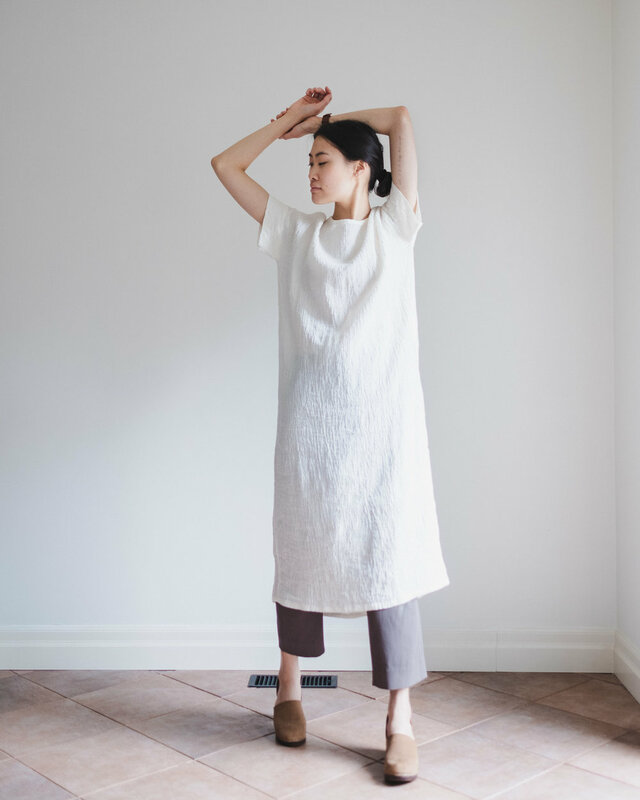 The Harper Tunic in Pepper Linen Gauze is such a lovely addition to my warm weather wardrobe. I decided to go for a dressed down look with my ripped jeans while still staying put together with a pair of low slingbacks. I love the high-low hem line of this top and the Pepper colour adds nice texture and interest to the fabric. This final piece is in the same Ivory Linen Gauze as the Georgia Midi I styled in outfit 2. I can definitely see this being a summer staple for a long time because of its classic silhouette, breathable material, and light neutral colour. I’ve styled it here with a pair of wide leg chinos and my chucks. This is a top that I know I’ll be wearing all season long with high waisted denim, shorts, or even as a layering piece on top of dresses or jumpsuits. Thank you so much for reading all the way to the end of this post! I really appreciate it! I hope you enjoyed learning about Elizabeth Suzann and seeing these beautiful pieces in action. You can check out their collections here. If you’re interested in the pieces or have any questions at all, feel free to send me a DM on Instagram. Also, if there’s any other way you want to see them styled, be sure to let me know! This post is in partnership with elizabeth suzann and contains some affiliate links. when you choose to shop items on my blog through my links, you help support my instagram and blog. i only share products and brands i love and support. all opinions are my own. thank you for supporting candice tay! 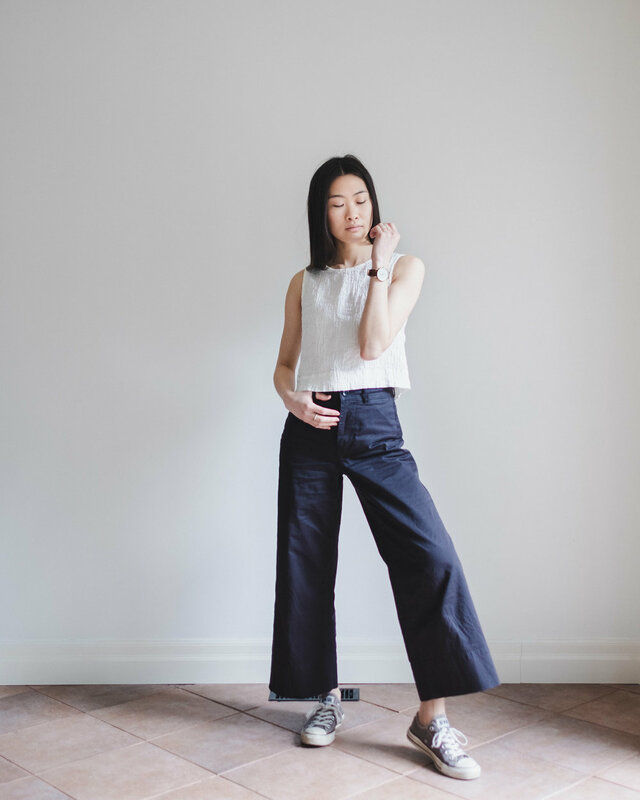 Sign up to receive tips on capsule styling, ethical fashion, low waste living, and more. Thank you for choosing to follow along with my journey.